- Why Make a Boot CD? I find that a boot CD makes a good emergency recovery tool. It is handy to have when the installation script of some OS3.x program, or my experimentation, corrupts OS4. It is configured to provide easy access to the tools used to rebuild the OS4 libraries, datatypes, MUI, and etc. This can be particularly important since the systems many of us run were not installed from a singe CD, but incrementally upgraded from OS4 pre-releases. Carefully consider your reason(s) when planning the layout. CD burner on another computer, and a way to move a 70MB image file (I used a USB-disk). OS4 system files, arranged in the directory structure for an OS4 boot disk. The CD does doesn't have to be created directly from a boot partition, it only needs a directory containing the proper files and directory structure. I work from a copy of my boot partition which is kept on another drive, but more about that later. Second Level Boot file, like slb_v2, slb_v2_nosfs, etc. 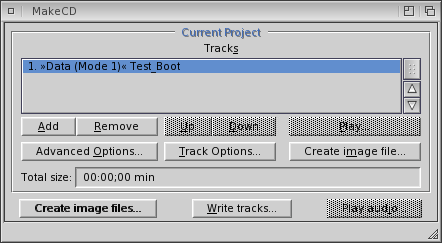 These are the things that should be done before making a boot CD. I strongly recommend that you think carefully about how the boot CD will be used. Will it operate "stand-alone" with all necessary software on the CD, or will it just boot a system, and then use software and data other drives. I also recommend copying the boot partition into a directory, if at all possible. If that is not possible, make back-up copies of startup scripts and configuration files, because they will have to be changed. Startup-Sequence: Comment out the network startup with a semi-colon ";". 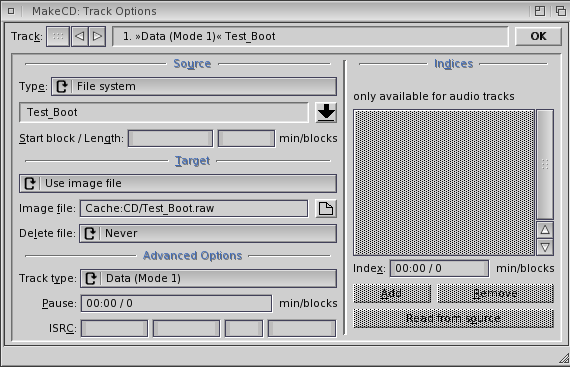 It interrupts the boot process by causing an error which requires user intervention when it tries to write connection log information to the CD. Network interfaces can be launched manually once the system has started. User-Startup: Check ASSIGNs to make sure they point to the CD, and not the hard disk boot partition. Check window and WorkBench backdrop image paths to insure that they will be valid. Otherwise error messages will pop-up each time AmiDock is used (it will be trying to update its prefs on the CD). AmiDock: Remove dockies that point to files which might not be available when the boot CD is used (more error messages avoided). Check the WBStartup directory for tasks that don't need to run. A CD is not as fast as a hard disk, so the startup process is longer. Run MakeCD (Yes, It's obvious, but I have to start somewhere.) Make sure you have set MakeCD to expert mode so you have all the options you need to follow this tutorial. 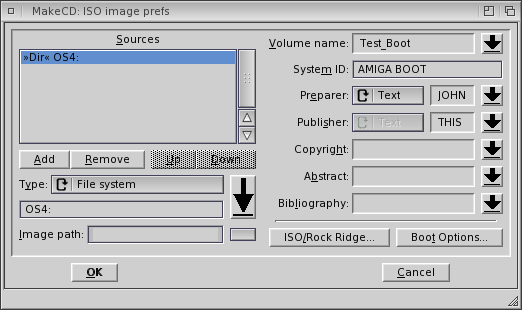 Set the source Type to "File System"
Set the Target to "Image File" to create an ISO CD image file -- or -- "Direct to CD writer" if you have a CD burner on your Amiga. Set System ID to "AMIGA BOOT"
Set Volume Name to any valid CD name (making sure that it matches setting made in Step 0). 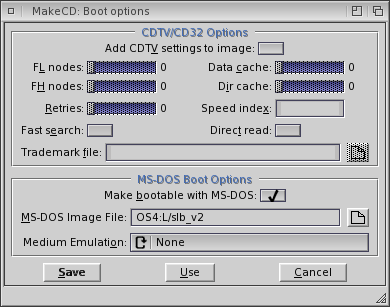 Set the MS-DOS Image File to the location of your Second Level Boot file, slb_v2. Note: the SLB file may be taken from any location, it need not reside in L:. Set Medium Emulation to "None"
MakeCD creates .RAW image files, remember to rename imagefile.RAW to imagefile.ISO if you are going to copy the image file to an M$ WinXX computer for burning.